So there we were, my young son and I…. My excuses for not blogging are few, but legit. My computer was fried in a tragic water/breathing treatment/flailing legs accident that may or may not have involved a young child that belongs to me. I’ve had to suffer all these months with ONLY an iPad (the horrors!!!! ), and typing more than one sentence on an iPad requires time and effort. Not only that, but an iPad doesn’t support the flash plugin, which means I can’t watch all the cute little videos of kitties and puppies that I would like to. Out of the goodness of her heart, my mom leant me her laptop for a few minutes this morning, so after I watch 17 videos of fluffy baby animals, I’ll share a short story with you. 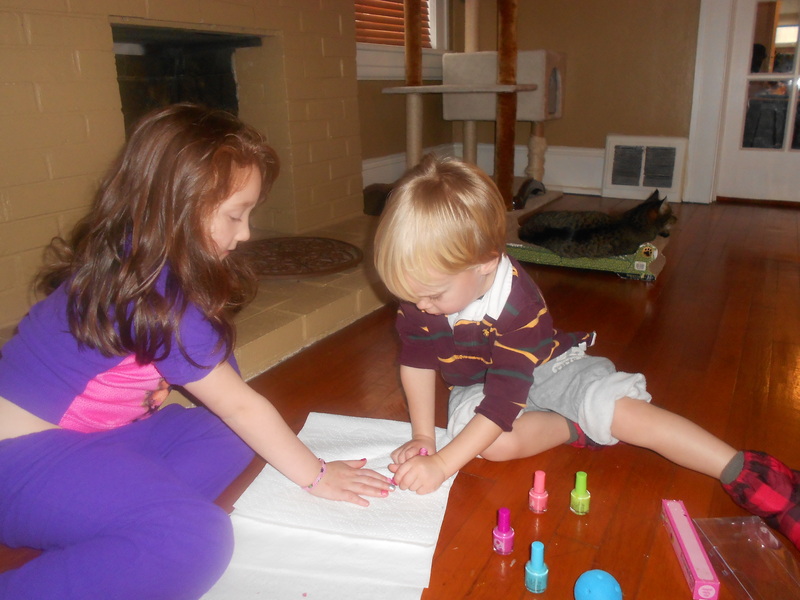 A little girl at Rowan’s “school-school” told him that, “Boys can’t wear nail polish! It’s not manly…” My guy held up a pink index finger and studied it with a furrowed brow. He glanced up and waited for me to defend the pastel colors that his cousin so carefully and lovingly adorned him with. I frowned, and considered started a gender debate with a four year old. I’ve been around kids enough to know, though, that I will lose ANY debate with a four year old-let alone a controversial one. The entire time I had been fumbling with an answer, Rowan had been letting the whole situation marinate in his innocent brain. I grinned and ran my fingers through my son’s long blond hair. Apparently that was enough of an answer to satisfy everyone, and we got our coats on and went home. The thought that pink is for girls and blue is for boys is a puzzling one to me. I mean, here’s the history of the whole color debate, ala the internet: http://people.howstuffworks.com/gender-color.htm (It’s an interesting read if you have the time.) I’m more confused with why people are so concerned with it. A very wise person once told me, “Pink is a boy’s color as long as a boy is wearing it.” THIS makes sense to me! I’ve never been one to care if my son plays with dolls, or wears jewelry, or dresses up in a tutu. In fact, one of his favorite things is an antique doll that he found in my mom’s work room and named “Far Sally.” He dotes on that doll; feeding her, changing her, playing with her, and occasionally seeing how high she can fly. Do I think all this is weird or wrong or going to turn him into a sissy? Not in the least! I think it’s going to turn him into an amazing, caring, and sensitive man someday.